ABOUT US-Glass Reactor Series|Rotary Evaporator Series-Zhengzhou Keda Machinery and Instrument Equipment Co., Ltd.
Zhengzhou Keda Machinery and Instrument Equipment Co., Ltd. is specialized in R & D, production, sales, teaching and chemical biology pharmacy equipment integrated company.Company tenet: keeping reputation, valuing contracts, supplying lower prices and better quality equipments to serve the cause of China's scientific research. 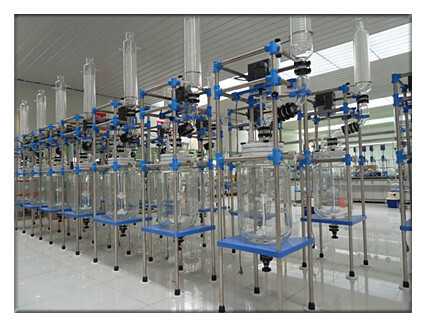 The company always adheres to the "quality casting brand, professional achieves service" business philosophy, and the main products are rotary evaporator, jacketed glass reactor, single layer glass reactor, circulating water vacuum pump, low temperature reaction bath (slot), low temperature cooling fluid circulating pump(cool chiller), vacuum drying oven, blast drying oven, freeze dryer, water/oil bath, magnetic heating stirrer, overhead mixer, ultrasonic cleaning machine, lift platform, etc. Besides, we act as agents of some domestic and foreign famous enterprise products, sustaining high praise in domestic junior colleges and universities, scientific research units, etc. Our products are sold to USA, Australia, Asia, Brazil, Iran, Egypt etc. countries and our customers have been fully affirmation. Our company absorbs the domestic and foreign advanced technology, and actively develops new products. We will continue to provide high quality products and good services in the future for scientific research institutes, universities and the pharmaceutical inspection, chemical industry, metallurgy, petroleum, biochemical, food processing priority project sincerely. Our company keeps credit, and emphasis on contract. We will provide excellent performance products and perfect after-sale service wholeheartedly for the pharmaceutical industry, chemical industry, food, as well as the colleges and universities laboratory service and so on.